A few months back, news about Deadpool director Tim Miller’s big Terminator reboot was coming in at a pretty steady clip, first with James Cameron saying that Linda Hamilton would return for the new movie alongside Mackenzie Davis and new murder machine Gabriel Luna. Since then, SkyNet has gone suspiciously dark, leading some of us to believe that, hey, maybe we don’t really need another Terminator movie? Apparently, though, the reason things have been quiet is because the new Terminator movie is already being filmed. 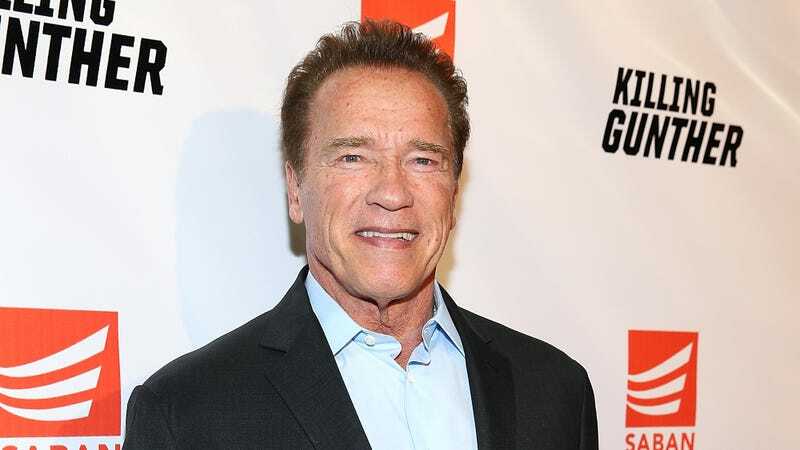 At least that’s what Arnold Schwarzenegger said when he needed an excuse for why he couldn’t attend a recent event for Frank Bainimarama, the prime minister of Fiji. In a pre-taped video message, Schwarzenegger explained that he was busy filming Terminator 6, which is surprising for a couple reasons. We weren’t sure if filming had already started for one thing, and also we didn’t know anyone was referring to this—even informally—as Terminator 6. It’s supposed to be a reboot, so that probably won’t be the real title, but it seems weird to still count Terminator Genisys as even slightly canonical. Also, Schwarzenegger has a beard in his video, and if he says he’s busy filming Terminator 6, does that mean we’ll see a Terminator with a beard?